approach to FSAE body design. Every year Carnegie Mellon Racing (CMR) designs and builds a new race car to compete in the FSAE series. 16e is our third electric vehicle, following 15e, the 2015 winner of the IEEE Excellence in Electric Vehicle Engineering Award. As the Lead Exterior Designer of CMR, I was responsible for leading the body design team from the early stages of conceptualization through to fabrication of the carbon fiber body panels. The body has been designed with smaller molded panels, and integrates carbon fiber closeouts for more efficient construction and assembly. The smaller nosecone allows for a more streamlined layup process, without the need for split molds. Due to the low speeds reached within competition, the aerodynamic impact is minimal. The design process began with hand sketching, using the chassis design as a reference. 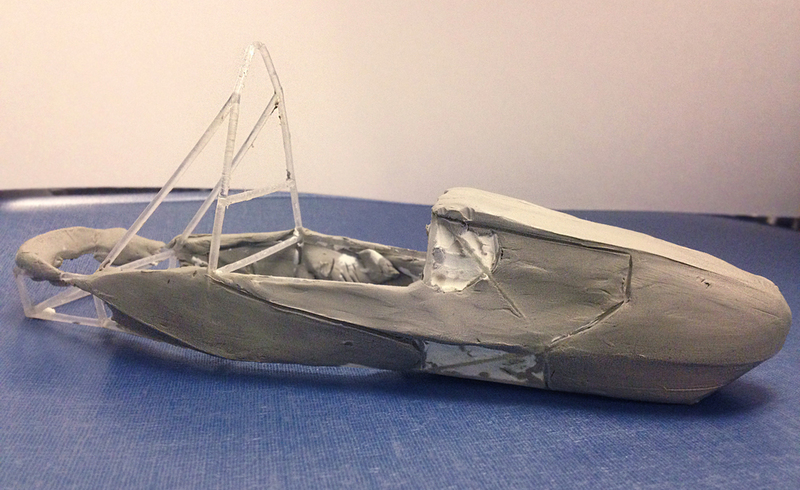 When the chassis was finalized we 3D printed a scale model and further refined our design through hand modeling in clay. Once the body design was finalized I created a Solidworks surface model, integrating it with the team's collective designs in the collaborative PDM assembly.